The 2015 Yates Memo shifts the focus of FCPA enforcement to identifying and self-reporting individual accountability to the DOJ and SEC. 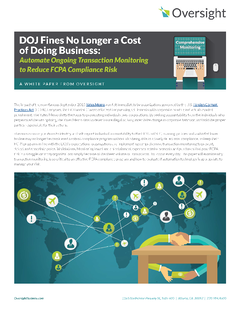 But a major gap for most organizations is an inability to accurately and consistently identify patterns of inappropriate behaviors in travel, entertainment and purchasing that pose FCPA risk. The sheer volume of transactions is a hurdle. Organizations need an effective automated transaction monitoring program that provides foresight before it's too late.